Winners of The Classy Geek's Call for Workspaces Contest! | It's not your tech, it's how you use it. 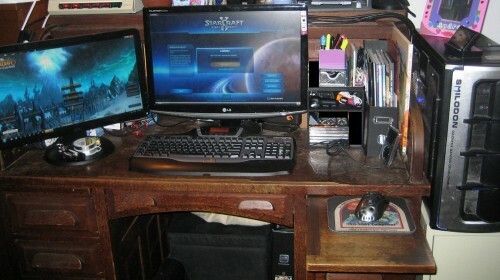 This week I’m more than pleased to announce the winners of The Classy Geek’s Call for Workspaces Contest! Over a month ago, I asked you to send in photos of your workspace, whether it’s at home or the office, decked out in technology or bare, personal or utilitarian – I wanted to see the world the way you see it every day, and boy did you all respond! 3rd Runner Up: HP USB Gift Pack, including 1GB USB Flash Drive, Retractable USB-to-Mini USB Cable, 4-in-1 Card Reader, and Mini USB Mouse! 2nd Runner Up: Iron Man and War Machine GelaSkin for the iPod Touch or iPhone! Reader and commenter Loli shared her office workspace that, aside from being a very nicely sized cube for an office workspace – much bigger than mine, I think – is personalized in some really Occhiali Ray Ban outlet unique ways. I particularly liked her cube’s guardian ghoul, the photos framed over her dual-displays, and oddly enough, the massive white and red mug-bowl sitting on her desk. The workspace felt cozy but organized, a place where work actually gets done but isn’t the kind of place you can’t stand looking at every day. I also liked the balance ball under the desk instead of a traditional chair, I thought that was a nice touch. Congratulations, Loli! 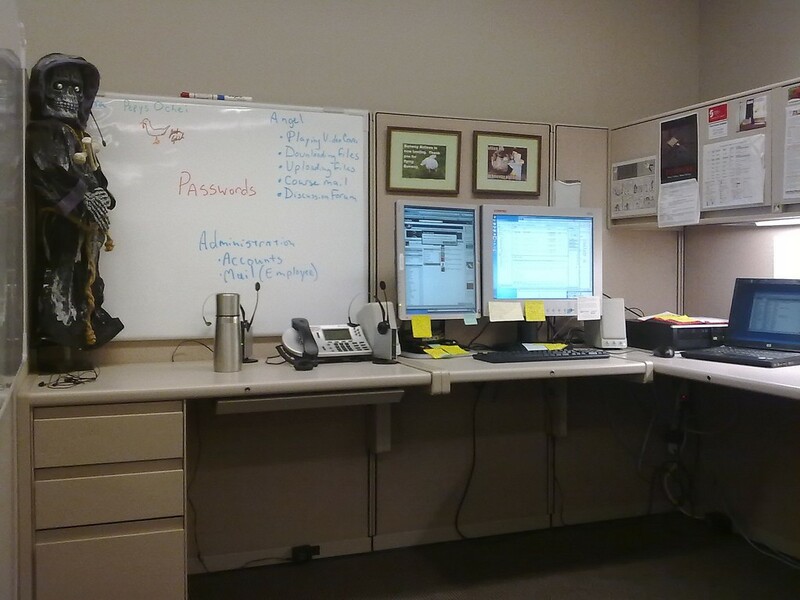 Davidd lives in Hawaii, and it’s difficult not to be jealous of him just for that fact, but even if you weren’t jealous before, this workspace photo is bound to make you almost rageful at your dull gray cubicle walls. 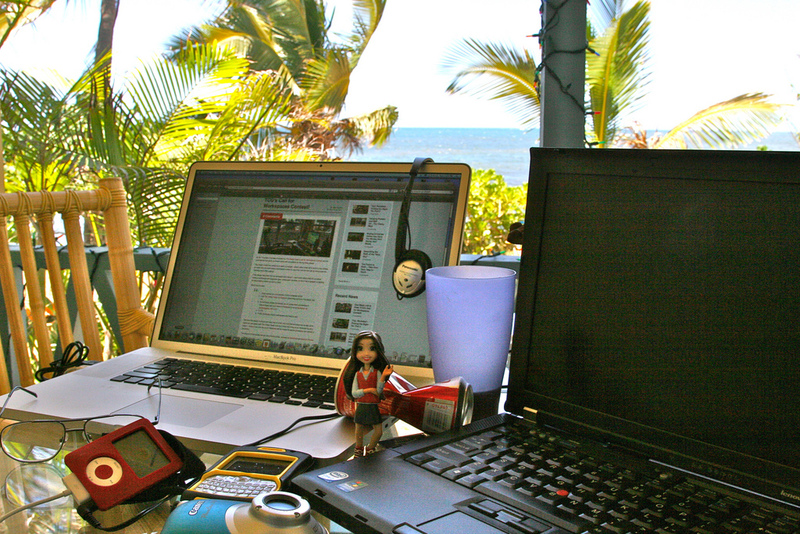 It looks like David is out on his lanai, relaxing with a can of coke and a pair of laptops, each doing a different thing. I had said all along to people thinking about entering the workspace contest that your workspace doesn’t have to be the cleanest or the tidiest or the most riddled with gear in order to win, it just needs to be interesting and highly personal, and David’s workspace here definitely fits the bill. Oh what I would give to have a view like that over the top of my laptops every single day! 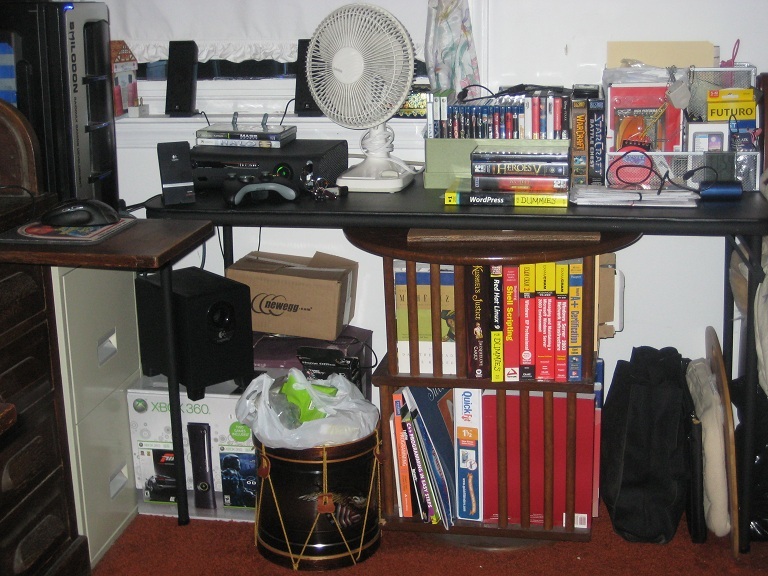 Liz, also known as Syddie, took a bunch of workspace photos for the contest, including some before and after shots of what her desk looked like before she did some tidying and re-organization, and then again afterward. 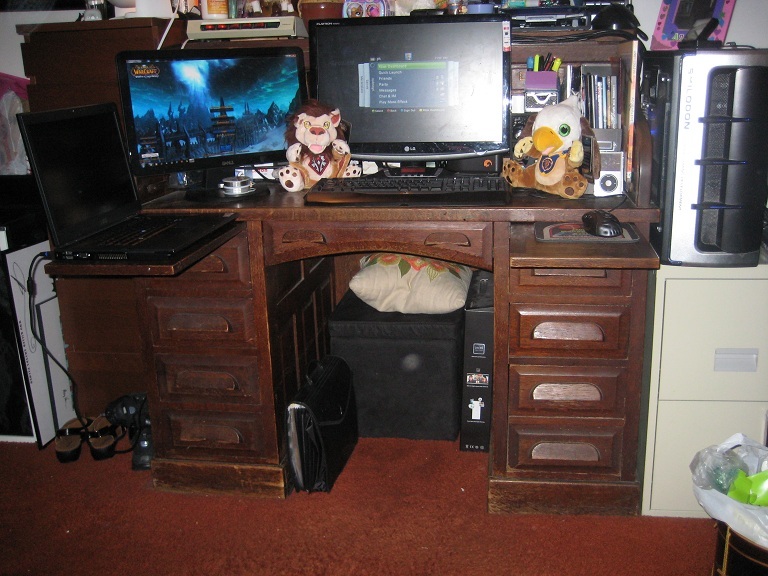 These are the after pics, although the before pics featured her adorable cat (named Francesca) who likes to keep her company while she’s playing World of Warcraft! Liz’s workspace is riddled with gear, including an XBox 360 off to the side but plugged in to her displays, a hand-built gaming PC in a really nice case, and the whole array connected to a pair of really nice monitors. Now the gear is really nice, but what really won me over about Liz’s workspace is that it looks homey and Ray Ban outlet really cozy – someplace you can spend a several hours hunkered down raiding dungeons on WoW or blowing noobs away on her XBox. 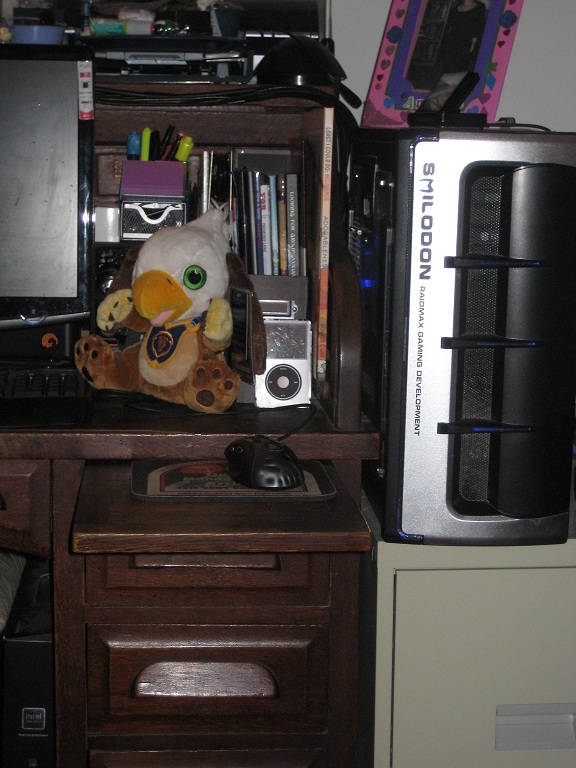 The Wind Rider Cub and Gryphon Cub (both World of Warcraft merchandise) are adorable, and the littany of technical books off to the side are telling to Liz’s geekiness as well! As much as I have a fond eye for technology in a space, I also really like design and furniture, and that solid old desk that Liz is using is one of my favorite things about her workspace – it has two pull-outs on each side that were likely originally designed for taking notes and adding a little workspace when needed but fits a laptop perfectly on the left and a mouse and mousepad perfectly on the right. I adored this workspace, and I think Liz definitely earned top honors – it’s truly a geek’s haven, and while she’ll be the first one to admit to you that she’s got a lot of tech crammed into a smaller space that she would rather have spread out a bit, I for one really like the way she’s made use of the space she does have. 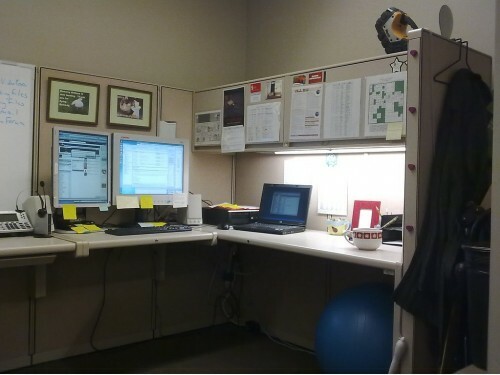 Congratulations to our winners, and many many thanks to everyone who sent in photos of their desks, both at home and at their offices, in their cubes and in their computer nooks at home. I’ll feature and use some of your other photos (with credit to you, of course!) in posts in the next several weeks, never fear – so even if you didn’t place in the contest, you very well may see your photo appear in a future Classy Geek post! What do you think of the winning workspaces? Let us know in the comments! Congrats everyone, and I love the ghoul!